This guest article comes to us courtesy of Derparnieux in Clan Quest. Derp is an avid clue hunter on multiple accounts and is someone that many go to for Treasure Trail advice. You can find him in Clan Chat, "Clan Quest". 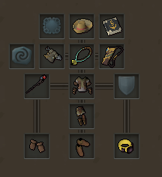 A picture of my personal preset, which I use for completing (mainly) hard and master clues. Even though bank presets are quite a... scarce resource in RuneScape, having one dedicated solely to Treasure Trails is an incredible blessing to the entire process of completing clue scrolls. Fill up your preset with useful items and teleports for the tier(s) of clues you want to complete, save the preset and you're done! Note that the example preset you see above is definitely not optimal - this preset is taken from an account without 99 Dungeoneering and Slayer (and therefore also no max), and these three capes are also very useful capes for clue hunters. However, it Is quite difficult to pinpoint what preset is the best for everyone. The truth is, different players most likely prefer a different preset. This is also why you will almost never find two clue hunters who use the exact same preset. This is partially based on what teleports and useful items you have unlocked, but also just on personal preference. The only way to find out what preset works for you is to start out with a generic preset, and then change it to your own liking. If there exists an item which combines the effect of other items, use that! Examples of this category are the large rune pouches, the passage of the abyss and Evil Dave's spellbook. The more room you save by combining, the more useful items you can take! The inclusion of items I'll refer to as 'convenience items' is a wise choice. Examples of this category are the Meerkats, the portable fairy ring and the spirit tree re-rooter. These items aren't strictly necessary to use, but they do save you quite some time in the long run. If you're sufficiently high-level, don't waste your inventory space on combat supplies. There is no need to bring potions and/or food; you can use the Meerkats' special move to skip all non-Double agent fights, and if there is ever a time when you need desperate healing, you can use one of the many available bank teleports in the game. Also, don't waste your money on skipping tickets. They're not worth it. With a bit of experience under your belt, you'll blast through the puzzles in no time. * Just kidding: Master farmer's hat, Captain's log, Tiranwwn quiver, Luck of the dwarves, Globetrotter outfit, Passage of the abyss**, Grace of the elves***, TokKul-Zo, Dave's spellbook, Big book o' piracy, Attuned crystal teleport seed, Wicked hood, Ectophial, Spirit tree re-rooter, Portable fairy ring, Compacted combat bracelet, Ardougne cape, Desert amulet, Disk of returning, The Heart teletabs, Fremennik sea boots, Karamja gloves, Drakan's medallion, Bullseye lantern, two large rune pouches (filled with air, water, earth, fire, law and nature runes), Meerkat pouches and Fetch casket scrolls. ** Inside the Passage of the abyss, I have: Amulet of glory, Games necklace, Ring of dueling, Skills necklace, Digsite pendant, Traveller's necklace. *** My max guild portal teleports are set to Overgrown idols and Deep sea fishing hub. Secret #3: Practice makes perfect! You might argue that this is not truly a secret, but I do believe that people underestimate how much better you get at doing clues with experience. Not only does practice allow you to fine-tune your preset, but over time you'll begin to recognize clue steps you've completed before - just this simple ability of recognizing clue steps saves you a lot of time in the long run. The Globetrotter jacket can be used to teleport to the location of a clue step. Now, you might wonder, when is the ideal time to use this teleport? Well, it depends on the tiers of clues you want to complete. In general, the effect is most beneficial for scan clues in large or annoying-to-traverse areas (think Elven lands, Brimhaven dungeon, etc.). After that, its biggest use is as a time saver for annoying to reach locations, like the lowest level of the Polypore dungeon or the two coordinate clues in Gu'Tanoth. The Globetrotter backpack provides the ability to swap a clue step for a new one of the same difficulty. No more dropping clues for which you don't have the requirements! I mostly use this to skip Wilderness and Entrana clue steps, though, or to skip an annoying clue step if I don't happen to have any jacket charges. The full Globetrotter outfit, when worn, acts as the outfit for emote clues if the respective hidey-hole is filled. No longer having to take items out of hidey-holes is such a time saver! It is easy to underestimate how helpful these effects are. I have now obtained the entire outfit on two accounts - I first obtained the outfit on my main, then decided to create an alt and I got the outfit entirely from scratch on this new account. Let me tell you, doing clues without the outfit while being used to the effects of the outfit really puts into perspective how powerful it is. Funnily enough, having unlocked the outfit on my main made it so that I purchased the pieces in quite an... unconventional order on my alt (backpack -> arm guards -> shorts -> boots -> jacket). The order in which you should buy the outfit pieces is largely up to personal preference, though, so the best advice I can give you here is to decide for yourself what effect you deem most necessary or useful. And I believe that's it for me! Hopefully this article has provided you with at least some useful tips for completing your stack of clues. Good luck on the loot, and if you have any questions, feel free to hit me up in-game or on Discord!